Baker Street is no longer just the home of Britain's most famous consulting detective, but also that of a nameless new café, which doesn't hide behind fancy branding but lets the wealth of natural and wholesome produce used in their daily changing menu speak for itself. Particularly busy during the lunch rush because of their wealth of sandwiches, quiches and take-away salads on offer, the café on 106 Baker Street was blissfully quiet when we visited this week for an early dinner. The light wooden interior and spare seating spaces create an open and inviting establishment, which is a welcome change from the hustle and bustle just outside. 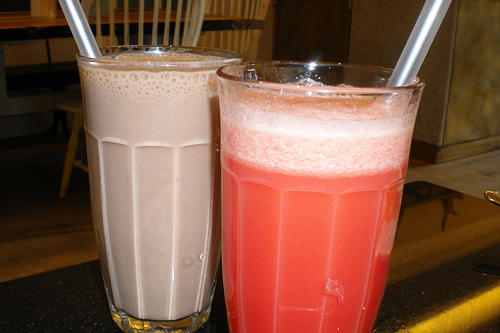 We started the meal with some freshly made drinks; an almond milk, banana and chocolate smoothie for me and a cantaloupe watermelon juice for my friend. The smoothie was really interesting in that all three of the different flavours could be tasted individually which each sip, but I'm still not quite sure whether I was merely intrigued or if I genuinely liked it! The watermelon juice on the other hand refreshing and fruity, going down really quickly. For dinner fare the cafe offers fish, meat, pasta and a veggie dish, all of which changes slightly on a daily basis, depending on what produce has been sourced from the markets. Both my guest and myself opted for the wonderfully presented gratined herb salmon, which was a delicious piece of beautifully pink fish, complimented well by its flavoursome herb crust. 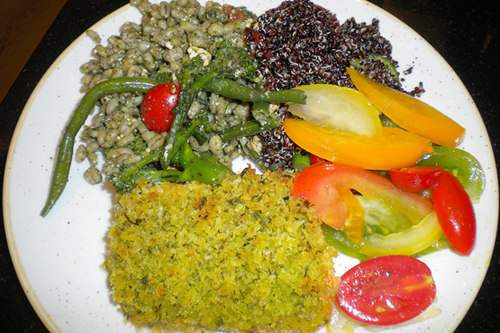 To accompany the fish, we picked three out of a wealth of brightly coloured salads displayed: brown quinoa with tomatoes and cucumber; pearl barley, broccoli, green beans and sunripe tomatoes; and a stunning dish comprised of thick slices of yellow, orange, red, green and even deep purple tomatoes. Each of the salads tasted impeccable and with so many fantastic ingredients it wasn't only super tasty but felt like a real health boost as well. Of course no dinner is complete without a tasty dessert and since it was 'Great British Bake Off Wednesday', cake definitely needed to be part of the meal. As soon as I spotted a beautiful carrot cake on display my mind was made up, as that is one of my all-time favourite sweet treats. And I wasn't disappointed; the cake was moist (but no soggy bottom to be spotted) and flavoursome, though it was the taste of the spices rather than the carrot that were really prominent to me. 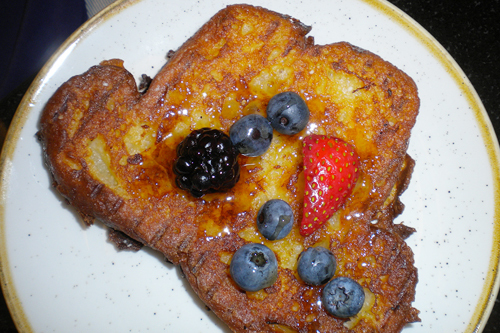 My friend chose the French toast which was made to order, so very fresh when she received it. This did mean that it took a little while to arrive and she commented that it unfortunately had gone cold by the time it was served. It did however look lovely on the plate and the slight disappointed was more than made up for when we also had a taste of the chocolate ricotta cake, which came highly recommend and we were told was a must-try. They were absolutely right. 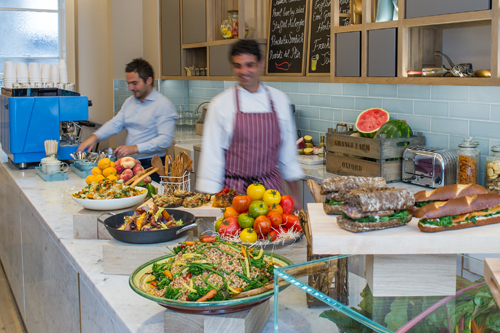 With a beautiful array of colourful dishes made with produce sourced from London markets and Italy, this newly opened café on Baker Street really stands out from the otherwise unimaginative range of chain restaurants located on the same street as the home of Sir Arthur Conan Doyle's famous detective. So even without an official name we are certain they will soon make a name for themselves as the place to be for a delicious and healthy lunch or early dinner. 106 Baker St, London W1U 6TW.